John Lascelles Farrant was born on 7 October 1918 at Perth Western Australia to Arthur and Gertrude Farrant. He was the eldest of four boys. His father Arthur was an electrical engineer and his grandparents John and Emily Farrant owned a large property at Gooseberry Hill. His grandfather had built a 12 inch (~300 mm) reflecting telescope and later helped John construct a 6 inch (~150 mm) instrument which was still in working condition in 2011. John attended West Leederville Primary School from which he won a scholarship to Perth Modern School, matriculating in 1937. In 1941 he graduated BSc from the University of Western Australia, with First Class Honours in Physics and on 19 September 1945 the University of Western Australia awarded him the Degree of Master of Science. In 1941 John moved to Melbourne to take a position in the Commonwealth X-ray and Radium Laboratory where he remained until 1945. At this time he learned that an electron microscope had been purchased by the CSIR Division of Industrial Chemistry. This microscope (an RCA EMU1) was the first one in the country and was to be housed in the Chemical Physics Section of the Division. John successfully applied for a position in the Section and after assisting with the installation of the microscope, was placed in charge of the Electron Microscopy group. After its installation in April 1945 John was soon able to master the special requirements of the electron microscope and he improved the performance of the machine above its specifications. Researchers with either physical or biological interests were attracted to the laboratory and he trained many Australians who desired to use these instruments. In the early 1950s John became interested in the iron-storing protein ‘ferritin’. The dense iron micelles in this protein make it clearly discernible in the electron microscope and he was able to determine the location of the iron in the molecule by simple and elegant experiments. One of these was the first observation of an effect, which many years later, became known as ‘negative staining’. John’s pictures of ferritin were of such high quality that a senior microscopist at the Conference on Electron Microscopy in Paris, in 1950 removed his own micrograph from the ‘Cabinet of Honour for High Resolution’ and replaced it with John’s. John also anticipated the use of ferritin as a label for other proteins particularly antibodies a widely used procedure in molecular biology. For electron microscopy the specimens to be examined are necessarily very thin. In 1955 John devised a novel ultramicrotome which avoided the use of bearings in the specimen support train. In his design (Farrant and Powell, 1956) the specimen was supported at the end of a metal flexure strip and was free to move only in the vertical plane. The specimen was retracted from the knife on the return stroke by using a second flexure point. This device was marketed, for a number of years, under the name ‘Si-Ro-Flex’ and manufactured by the Fairey Aviation Company of Australasia Pty Limited, Salisbury, South Australia. Schuco Scientific handled sales in the United States and Aeon Laboratories in the United Kingdom. Knives made from glass were used, initially, for thin sectioning. However, the successful development of diamond knives by Fernandez-Moran prompted John to encourage GM Stiff MBE to produce diamond knives locally. Geoff Stiff had developed considerable skill when making diamond tools for ruling diffraction gratings in the Division. This venture was highly successful and a number of knives were made and other knives re-sharpened. John remained with the Electron Microscopy Group during the remainder of his research career in the laboratory that became the Division of Chemical Physics. He became a Chief Research Scientist in the mid-sixties and spent the last fifteen years of his working time in CSIRO, designing and developing an oil-free vacuum pump. He retired in 1982 but continued to seek, at his own expense, uses and manufacturers for the pump worldwide. Only a stroke which he suffered in 1998 prevented him from continuing this activity. 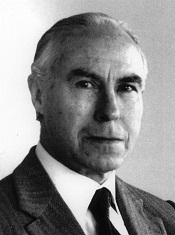 Throughout his scientific career John received wonderful support from his wife Lesley Patricia Garner (Pat), a graduate in Psychology from the University of Melbourne, whom he married in November 1945. John Farrant died in Melbourne on 8 July 2003. John served on the Editorial Advisory Board of two international journals of electron microscopy one (Ultramicroscopy) devoted to physical aspects while the other (The Journal of Ultrastructure Research) specialised in biological topics. John was an invited speaker at most international electron microscopy meetings during his career. He was on the Executive Committee of the International Federation of Societies for Electron Microscopy and was asked to organise the Eighth International Congress for Electron Microscopy, held in Canberra in 1974. McLean D, 2011, Personal communication. Cornish P, 2003, Obituary in the West Australian, p.102. Farrant JL, 1954, ‘An electron microscopic study of ferritin’, Biochimica et Biophysica Acta, 13: 569-576. Farrant JL, Powell SE, 1956, ‘A new ultramicrotome’, In: Proc. 1st Regional Conf. in Asia and Oceania, Tokyo, p.147. ‘Methods for the production of Specialized Diamond Tools’, Division of Chemical Physics, Annual Report 1976-77, p.17.